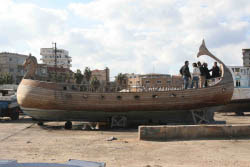 TYRE: A Phoenician-style boat will soon set sail for Europe from the port city of Tyre in a bid to highlight the contributions of the ancient peoples of current-day Lebanon to human civilization, as well as the role that the country can continue to play in modern global society. The ship was named Europa, after the Phoenician princess Europa, the daughter of Agenor, the Phoenician king of Tyre. According to Greek mythology, Europa was abducted and taken to Crete by Zeus, the king of the gods, who had transformed himself into a great white bull. Legend has it that the continent of Europe is named after her. The project is being carried out by the Peace Missions Association. Fadi Maalouf, a member of the association, told The Daily Star on Tuesday that the boat "will carry 16 people representing Lebanon's different sects on a tour that will include Cyprus, Greece, Turkey, Malta, Italy, Spain and France." "The project will be formally launched during a conference to be held at the American University of Beirut on January 14, before the trip takes place in the spring," he added. Maalouf said the goal of the project is to raise awareness among citizens of foreign countries about past and present civilizations in Lebanon. "The project also aims to encourage our officials to organize their relationships, unify their efforts and respect their country's past and present while working on building its future," he added. Charbel Helou, one of the participants in the trip, said, "We will show the entire world that Lebanon is not an arena for conflicts and explosions, and deliver a humanitarian message that the country enjoys a rich culture and knowledge." The boat measures 13 meters long and 4 meters wide, with a sail representing the Lebanese flag. Maalouf said the boat was designed according to the Phoenician style. "The front of the boat was given the shape of the head of a horse, while the back has taken the form of the tail of a whale, just like real Phoenician ships."